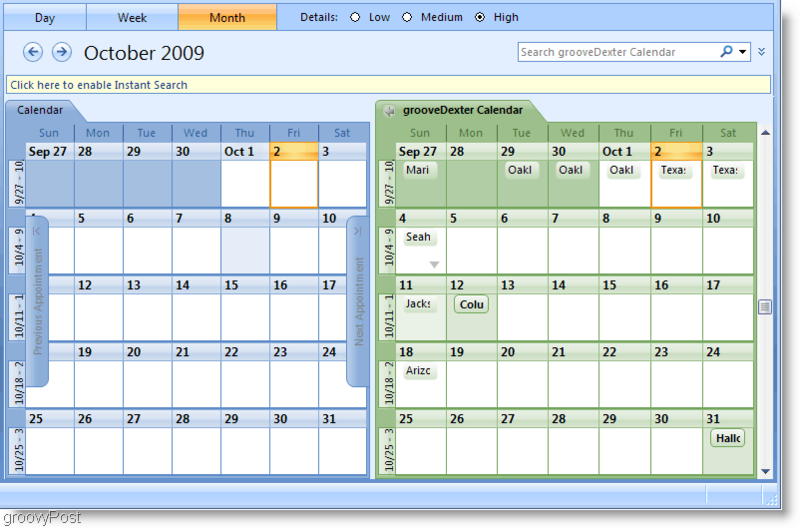 With the Side-by-side calendar view support of Outlook 2007, adding my Google Calendar to my Outlook 2007 client at work was a simple yet effective way for me to avoid missing personal appointments. 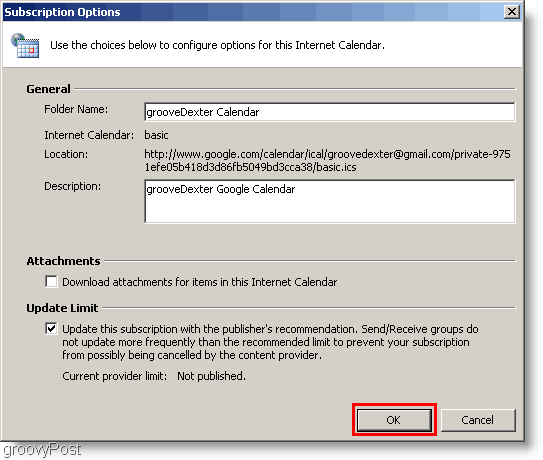 The process works by configuring Outlook to connect or subscribe to the Google Calendars Private ICAL address. 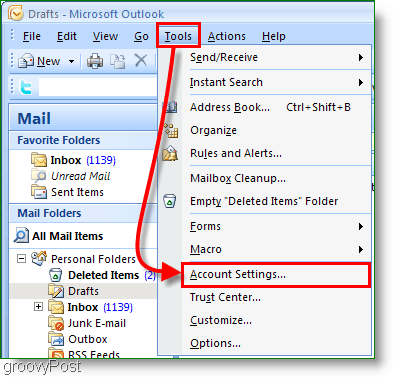 Update 12/4/2010 – Updated the article here for Outlook 2010. ICAL only allows for READ ONLY access to your Google calendar inside Outlook. You cannot make any changes. There is no authentication on the Private ICAL address so be sure not to share it with anyone unless you want them to see all your Google Calendar Appointments/Events. Okay, enough small talk. How do we do it? 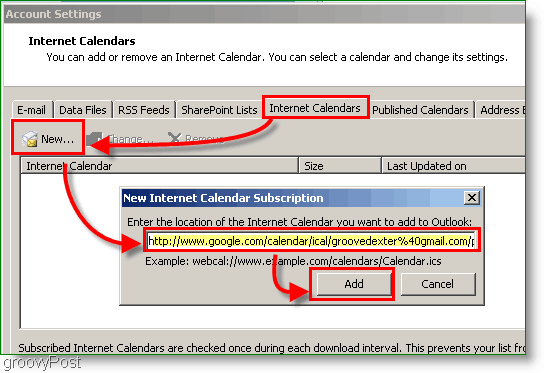 How-To Add Google And Other Internet Calendars To Microsoft Outlook 2007. Finding the ICAL address can be a little tricky. First open your Google Calendar, Click Settings. Then once the page loads Click Calendars. Click the calendar you want to display in Outlook. Below I selected my groovyDexter Calendar. Before you continue, did you copy the ICAL address from the PRIVATE address and not the Calendar Address? This choice is important. Double check now. In the account settings pop-up Click Internet Calendars. Next, Click New then Paste the ICAL address into the white box and Click Add. 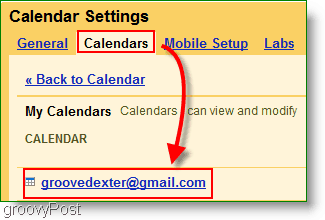 Open your Outlook Calendar and look for the newly Created Google Calendar on the left sidebar. Check the Box to display it next to your existing Calendar. Viola! Now you can see both your Outlook Calendar and your Google Calendar simultaneously. Please remember that this process leaves your Google Calendar as “read only” so you won’t be able to mess with it from within Outlook. If you find it’s not getting updated frequently enough, just press the F9 Key to force an update/pull from your Google Calendar. Questions, Comments? Drop a comment below, or Join us in our Free Technical Support Community Forum! Note that if you right click on the calendar and choose ‘View in Overlay Mode’ it will put the calendars on top of each other, making it very easy to see appointment conflicts and the like! @TechTalk, great tip! Thanks for the feedback and welcome to the site! @MrGroove, Thanks! FYI you guys were selected as a ‘cool site’ of the week by us this last week, so hopefully that will drive a few clicks your way :) Keep the good stuff coming! ok – after I sync the calenders…. it seems as though the online calender’s time zone changes – everything is one hour off. How do I fix that? is there anyway to enable to create a calendar appointment? i have heard about google sync but its only for business/school users not ordinary accounts. i use my calender on my android phone so it would be very useful to edit within outlook, as i travel. I use Outlook calendar for business and Google for privat matters. Would it be possible to integrate Google Calendar items in Outlook as privat items? A little glitch here, you say “Right-Click the ICAL button and Click Copy Address” and when pasted into new calendar box it magical turns into http and where did the https go ? Great info. I could successfully configure the google calendar. Unfortunately besides removing the download they crippled the program so it no longer functions.However all is not lost. There is a program called gsyncit at gsyncit.com (fieldstone software) that does it and more. The free version makes you wait 14 seconds (big deal) and only syncs email I think. The paid version syncs everything. Good luck.